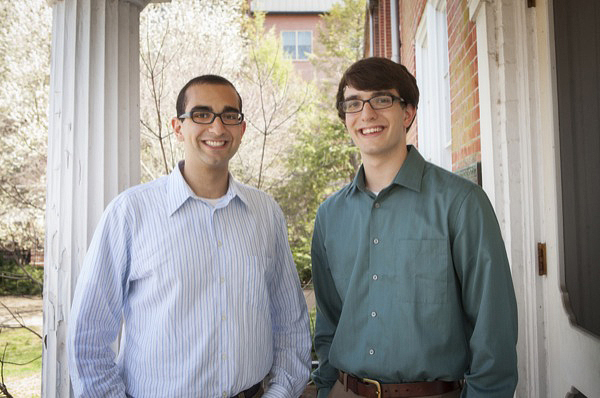 UD's 2013 Goldwater Scholars are Peter Attia (left) and Douglas Kenny. 11:10 a.m., April 11, 2013--Two University of Delaware seniors have earned a scholarship from the Barry M. Goldwater Scholarship and Excellence in Education Foundation, considered the premier undergraduate award of its kind. Peter Attia, a chemical and biomolecular engineering major, and Douglas Kenny, a chemistry and biochemistry major, were among 271 Goldwater Scholars selected this year from 177 institutions nationwide. The scholarship program, which honors the late U.S. senator from Arizona, aims to inspire outstanding science, technology, engineering and mathematics (STEM) students to pursue STEM-related careers. The award provides recipients up to $7,500 per year toward tuition, fees, books and room and board costs. Attia, a Hockessin, Del., native, said the scholarship is a reminder of how blessed his life has been and the obligation he has to help others in return. “I am grateful for my family, friends, health, safety, education and the opportunity to make the world a better place,” remarked the Honors Program student, who is currently considering graduate school in materials science or chemical engineering. At UD, Attia is conducting research on novel applications for thermoelectric materials with Joshua Zide, assistant professor of materials science and engineering. Long term, he aspires to develop materials for water purification and energy. In addition to Zide, Attia acknowledged his family; Susan Serra, program manager for UD’s Office of Service Learning; and his “many excellent professors,” including Susan Groh, Burnaby Munson, Thomas Powers and Ismat Shah, for his success. Kenny, of Sayville, N.Y., described the Goldwater award as a boost to both his plans to attend graduate school in biochemistry and his confidence. "It's really humbling to have my work recognized for such a prestigious honor," he said. Also an Honors Program student, Kenny hopes for a career as a professor. He currently conducts research with Catherine Grimes, assistant professor of chemistry and biochemistry and of biological sciences, focusing on synthesizing a variety of small bacterial cell-wall fragments that can be used in studies related to the activation of the innate immune system. The research has benefits in better understanding the causes of inflammatory bowel disease. For the past two summers, Kenny has worked at Brookhaven National Laboratory on a variety of research projects related to the metabolism of bioenergy crops. "I definitely would not have gotten this award without the professors and teachers I've had throughout my education, especially at UD," he said. He particularly thanked Grimes and her research group, as well as Serra; UD professors Groh, Munson and Harold White; and Benjamin Babst, his research adviser at Brookhaven. Another current UD student, Alexandra Bayles, a chemical and biomolecular engineering senior, was a Goldwater recipient in 2012.